Ever Been to a Bordello? Me Neither. I’ve also never been to a brothel or whorehouse (my mother must be beaming). But since I’m neither a man nor a cowboy/miner my, um, lack of experience isn’t surprising. Turns out the ladies knew more than just how to show a good time, they also knew how to secure payment in advance. 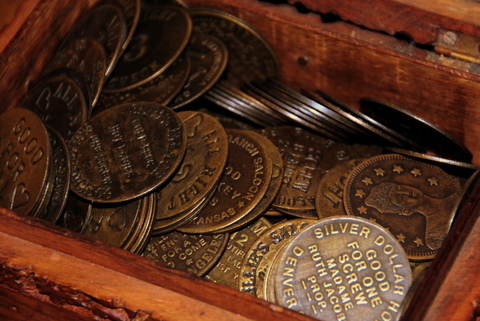 Guests had to buy tokens upon entry to the “house” – before they could spend all their money gambling or drinking. 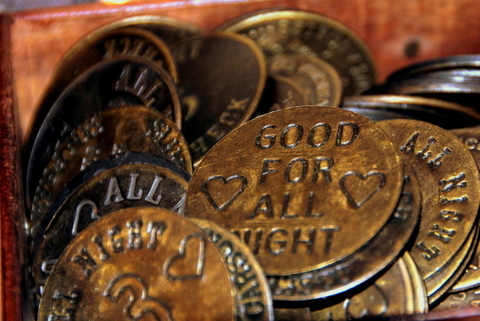 The tokens explicitly spelled out what explicit acts they payed for: click on the pictures for examples. The men also were required to take bath before spending time in the bedroom. Smart move, gals! Wow, who knew! Very interesting! Facinating! Where did the pictures come from? The pictures are from the Jack Daniels souvenir shop in Lynchburg TN! A bounty of learning!